Brand portraits are an extension of the traditional professional head shot session a person receives for their business or brand. Branding photo shoots allow you to showcase not only your personality, but present your vision and business. Having brand photos for yourself helps to boost your confidence, increase viewership to your social media pages, website and to showcase your brand products, message and personality. You want to be able to showcase your product, service or brand. It'll put a face to the name of your business, service or brand. Visual presence shows your audience or community that you care about what you're offering. Helps to target your market audience and visually relate to you and engage with you. It helps to have a clear vision of what your brand's message, aesthetic, and vision for how you want your brand to be seen. Be ready to make an investment in booking with a photographer for your branding portraits. ( You could also hire a stylist, makeup artist and hair stylist to ensure the ultimate portrait branding experience). Have an idea of where you would like to have your photos taken, whether it's indoor or outdoor, formal, informal, posed or freestyle. Be open to the photographers suggestions, but above anything, be optimistic, relax and enjoy the experience. As a photographer, I became accustomed to taken my own selfies and self portraits. Essentially, your portrait is one of the most important key features of your branding. I have take my photos for my blog and brand since I started photography 7 years ago. I always knew that I would have to "bite the bullet" and hire my own photographer to take the photos that I wanted to see for myself and my brand. Truthfully, I love being behind the camera but never wanted to focus on being in front of it, because let's face it, the camera can be intimidating at times. It's an easy task to get over once you realize how much of an impact embracing yourself and your photos can be. This year I decided to invest in branding portraits for myself and my business, LeSha Brewer Photography & Designs LLC and The Lovely Photog. I also offer branding portraits for bloggers and entrepreneurs like myself. I chose a local phenomenal photographer, Contemporary Images and makeup artist, KR Beauty Bar. I also chose my color scheme for my outfits and decided on the location and look for my photos. 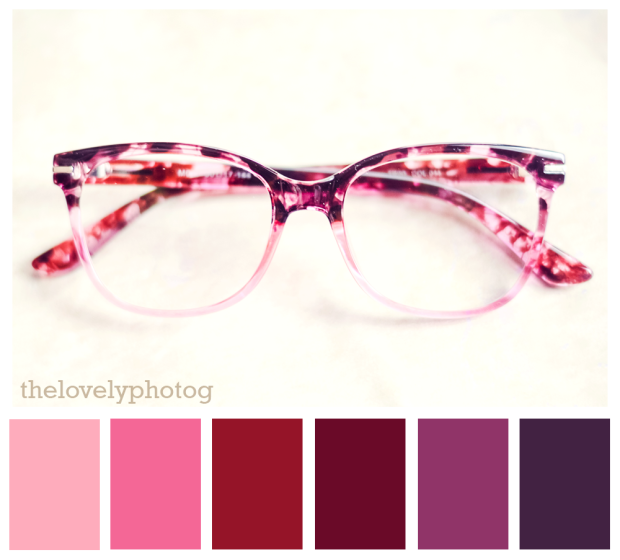 It helps to have a color palette in mind, and I chose different shades of red and purple. One of my color palettes I created and drew inspiration from. There were definitely some things I would like to change about my posing and wardrobe for the second look, but the point was to initiate branding photos for my brand, which is an ongoing effort, and to step out of my comfort zone. This branding photo shoot was pretty straight forward as I wanted to focus on "headshots" and a more formal approach. I do recommend having a formal and informal option to branding portrait sessions. The informal options are the ones that are more relaxed and less posed. My photographer did a great job in assisting me in my vision and asking questions to make sure I was comfortable. My advice is to make sure that you're comfortable doing the poses that are comfortable for you and to make sure you have a vision of what your branding photos to look like. I'm excited about doing more photo shoots for my brand and invite you to explore your options for branding photo shoots. I promise you won't regret it. Have you ever considered a branding portrait session? Why or why not?